Once we were California dreaming and California was the place that you would go to pursue your dreams. Today, it is the state where you are from, not where you are going. When the largest state, population wise, is failing, it does hurt the nation. The following stats illustrate California’s problems. California has some of the nation's highest state taxes including gasoline, sales taxes and is a top bracket of income taxes, and this has resulted in the lowest bond rating nationwide. Poverty rate at 23.5% and California is home to one third of those living in poverty and tied with two other states with the highest unemployment rate at 9.6%. Those high gasoline prices are part of the reason that California has the highest energy costs. And California is the worst place to do business, which goes hand in hand with the high rate of unemployment. Many middle and lower income people are leaving, and the reason is the job losses. And it doesn’t help that a middle class family will pay nearly three times for a house in California than in Texas. As taxes goes up on the wealthy, many of those wealthy, who contribute nearly half of state incomes taxes, simply will go elsewhere, joining the exodus of their less wealthier Californians. The Democrats, which are dominated by the left, have complete control of the house and Senate, and they have succeeded in passing some the most stringent anti-growth measures. Jerry Brown brags of balancing the book, but this ignores the off-budget pension deficits, which continues to grow, and it is also masks problems of many municipal localities who face their own bankruptcy. While some view California as “a blue state” success, the facts say differently. 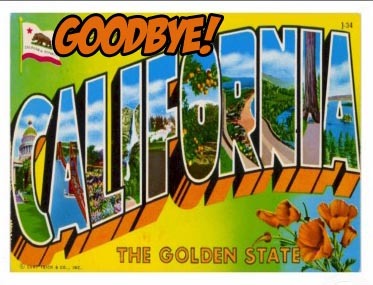 California is in decline and nothing short of a second tax rebellion will be required to save what was once the Golden State. Texas has now become the state that dreams are made of. In 1848, California's gold rush helped populate the state and saw millions come to pursue their dreams, but until a true free market party arises in this State that can challenge the leftist dogma that is ruining this state, the only gold rush will be the rush out of the state. Irony is that California is sitting on a ton of what the old TV show, The Beverly Hillbillies, called Texas Tea. There is an abundance of natural gas and oil just waiting to be developed. New energy gold is in the ground ready to be mined, and you have a state government that is merely willing to let it sit. And in the process, make the state poorer. It would be nice if America was once again California dreaming but instead it is a state slipping into its night fall of bankruptcy.